IOWA CITY, IOWA -- Former University of Iowa student-athletes Mark Weisman and Melissa Dixon have been selected as Iowa's 2015 Big Ten Outstanding Sportsmanship Award winners. The duo was chosen from Iowa's 2014-15 Big Ten Sportsmanship Award winners, which include a representative from each of the UI's 24 varsity sports. 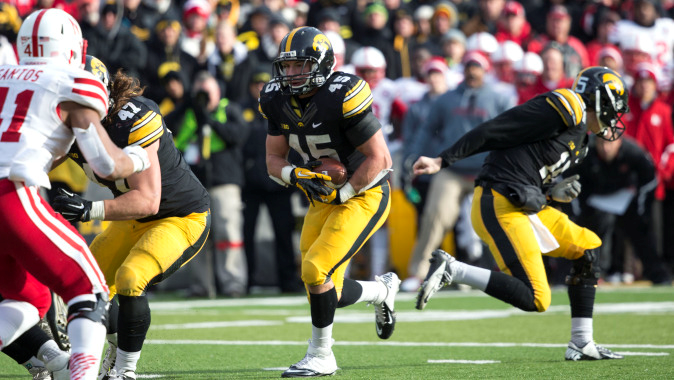 Weisman, a native of Buffalo Grove, Illinois, led the Hawkeye football team in rushing the last three seasons. He ranks third in career rushing touchdowns (32), fourth in career attempts (599), sixth in career rushing yards (2,602) and 10th in career scoring (198 points, one receiving TD) in Iowa school history. Weisman is the eighth Hawkeye to surpass 2,000 rushing yards and 20 rushing touchdowns, the sixth Iowa running back to lead team in rushing for three straight seasons, and just the third Hawkeye to rush for over 800 yard in three straight seasons. A three-time academic All-Big Ten honoree, he was named to the Capital One Academic All-America second team last fall. He has signed as an NFL free agent with Cincinnati. Dixon, a senior from Johnsburg, Illinois, earned second team All-Big Ten honors this season. She led the nation in 3-pointers per game (3.65) in 2014-15, becoming the first Big Ten player ever to lead the country in 3-pointers per contest, and just the seventh to do so from a major conference school. Dixon ranked sixth nationally, and second in the Big Ten, in 3-point shooting percentage (45.1%; 124-275). She is Iowa's record-holder for 3-pointers in a career (334), season (124), and game (10), and set the Big Ten single-season record for 3-pointers (127) this year. Dixon set or tied the arena record for most 3-pointers in a game in at least five venues this season (Drake, Rutgers, Illinois, Northwestern, and Iowa). The 2013 Big Ten Sixth Player of the Year ranks 12th in career scoring in program history (1,480 points). Dixon ranks 26th in NCAA history in career 3-pointers (334). The Big Ten first awarded the Outstanding Sportsmanship honor in 2003. The student-athletes chosen were individuals who have distinguished themselves through sportsmanship and ethical behavior, were in good academic standing, and demonstrated good citizenship outside of the sports-competition setting.